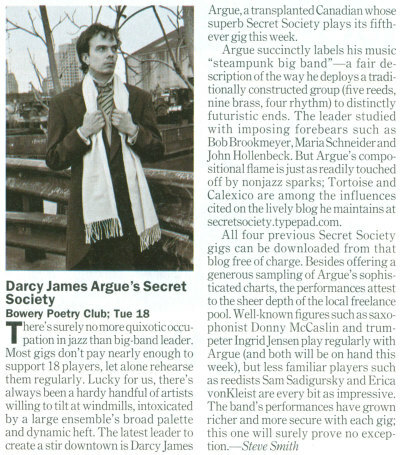 In this week's Time Out New York. I look forward to listening to the recording. I was wondering, do you dress like that on a daily basis (if so, cool! ), or just for publicity shots? Not to dispel my carefully cultivated aura of mystery or anything, but the morning coat was a rental. I do, however, own a smoking jacket. im about to download the tunes you posted... sounds very good from the description... looking forward it listening, and one day a live show when I make it back to nyc. I wish we were there to hear you in person. It is about time someone wrote a review, but a dynamic announcement in advance is even better. Now more people will get to hear you. Congratulations!